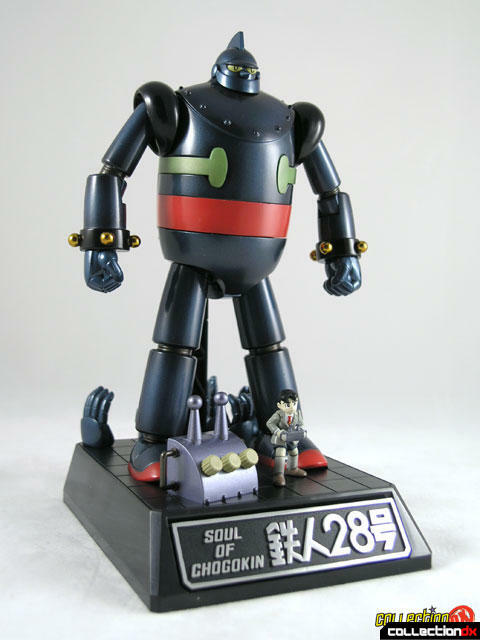 Maybe it was a bout of temporary insanity, but I wasn't going to get the Tetsujin 28 Soul of Chogokin. 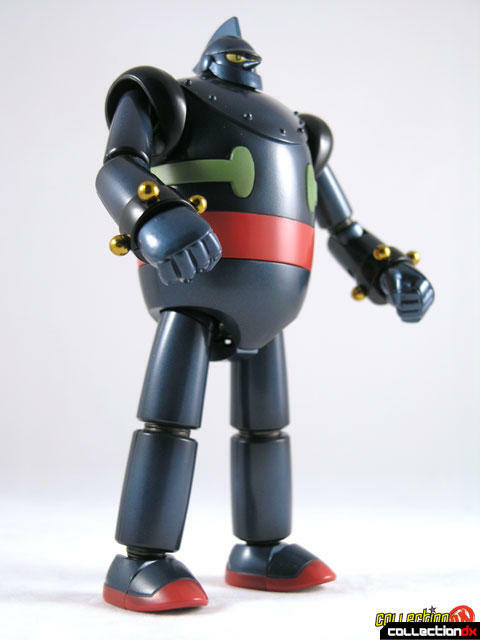 I already have plenty of representations of the character, and I really like the Medicom Miracle Action Figure version. That all changed when I held the toy at the 2005 Chogokin Summit. Wow, what a great toy. Where do I start? First of all, T-28 is loaded with accessories. 3 different sets of hands, A damaged arm, jetpack, control box, and a little Shotaro Haneda. The stand is typical SOC fare, but we're back to the embossed nameplate this time. 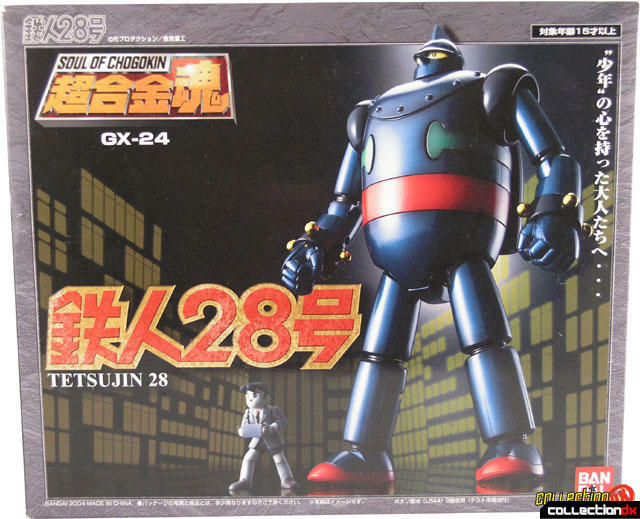 Tetsujin 28 is all metal. Well not 100%, but he feels like it. The body is just a big hunk of metal. 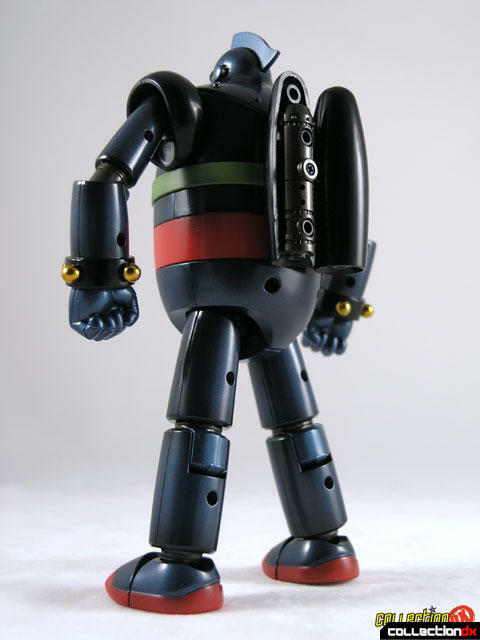 The arms are removable via the standard SOC magnetic joint. The fists pop on and off with ease. The jetpack attaches to T28's back via a magnet peg, and the panels on the jetpack are removable, showing the mechanics inside. You can also remove the whole belt assembly that holds the jetpack on, although I don't know the purpose of this feature. The jetpack does not light up, although that would have been a really cool. The toy has a waist joint, and you can actually separate the waist to reveal the battery compartment. Yep. 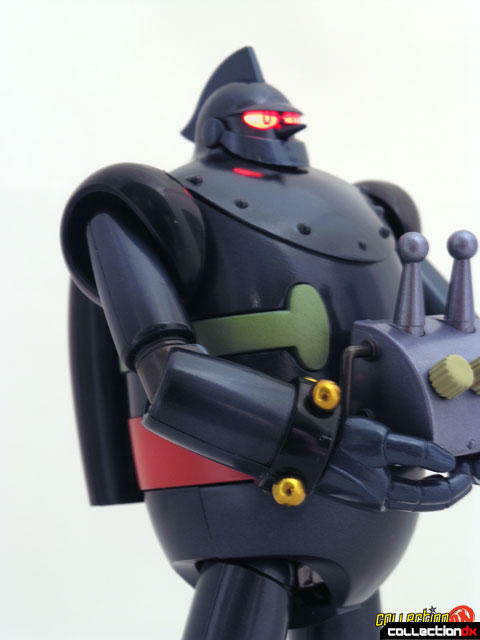 Tetsujin 28 has a very VERY cool light up feature. Slide the switch behind his head to light up his eyes. But wait, that's not all. Place the large control box to Tetsujun 28's chest, and his eyes turn red! It's awesome! Another cool feature is the dual hip joint. It's kind of hard to explain, but you can actually pull down his hips to allow for a greater range of motion. 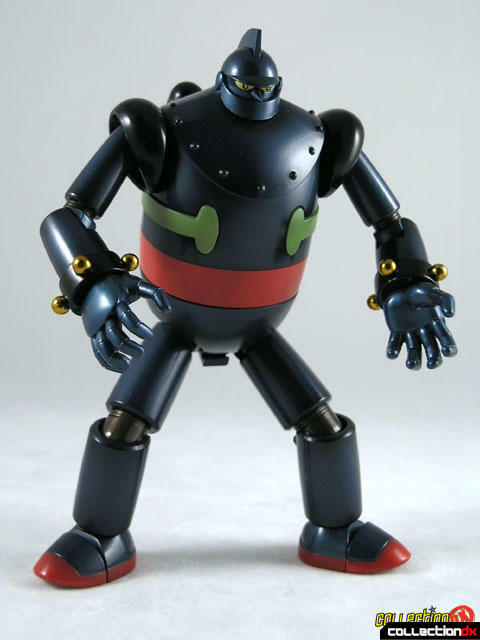 This, combined with the toe joints, makes Tetsujin surprisingly poseable. This is almost a perfect toy. My only complaint is the Shotaro figure. 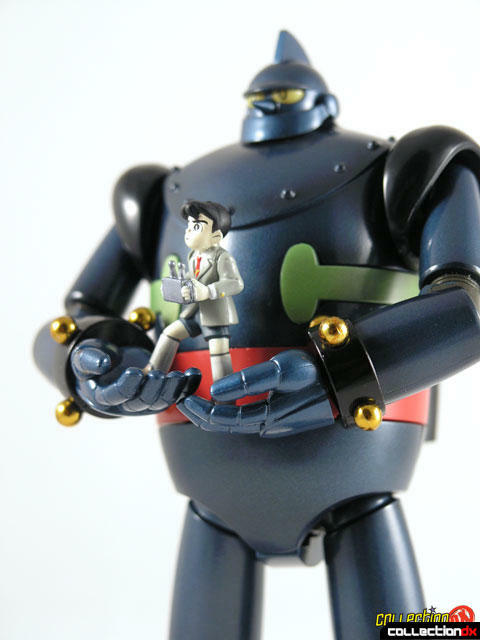 He has no peg to secure him to the base, and he can't really stand in Tetsujin's hands. It would have been nice if Bandai could have done something more with this. Aside from that - awesome toy. Hi, how tall is the figure? It looks great. I'm kind of hoping he's at least 7" tall standing.